Xiaomi has introduced three new Redmi phones in India. The new Redmi 6 series comes with Xiaomi’s first phone with a notch display. Xiaomi on Wednesday introduced a new smartphone series in India. The latest Redmi 6 series features Xiaomi’s first phone with notch display in India. The new range includes three new phones - Xiaomi Redmi 6, Redmi 6A and Redmi 6 Pro. The new smartphones are available in Rose Gold, Blue, Gold, and Black colour options. Xiaomi Redmi 6A (2GB + 16GB) is priced at Rs 5,999 (introductory price for two months). Redmi 6A (2GB + 32GB) is priced at Rs 6,999. Redmi 6 Pro (3GB + 32GB) is priced at Rs 10,999. The top-end model of Redmi 6A with 2GB RAM and 32GB storage is priced at Rs 6,999. Redmi 6A with 3GB RAM and 64GB built-in storage is priced at Rs 9,499. Redmi 6 Pro with 4GB of RAM and 64GB storage is available for Rs 12,999. Apart from the screen size upgrade, Xiaomi’s new phones come with AI capabilities for better photography. 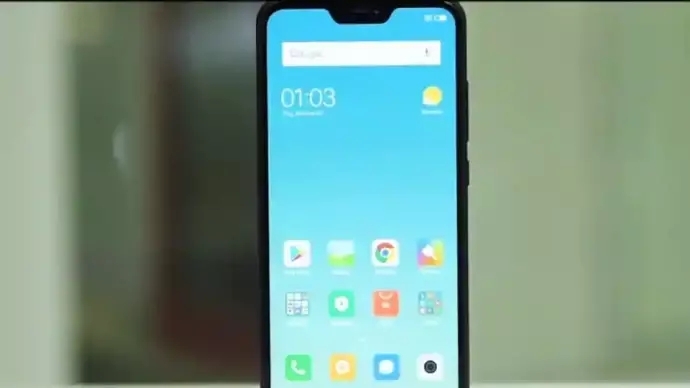 Redmi 6, Redmi 6A and Redmi 6 Pro run on MIUI custom ROM, based on Android Oreo. The new phones will be upgraded to MIUI 10 as well. Xiaomi says its new phones come with dual pyrolytic graphite sheets that help decrease the overall temperature by 2 degrees celsius as compared to phones with single pyrolytic graphite sheet. The new Redmi 6 series will succeed Xiaomi’s entry-level Redmi 5 and Redmi 5A phones which are available in India at a starting price of Rs 5,999. The smartphone has a notch cutout on its 5.84-inch Full HD+ display with an aspect ratio of 19:9. Powering the smartphone is Qualcomm’s Snapdragon 625 processor paired with 4GB of RAM and 64GB of onboard storage, expandable up to 256GB via microSD card. 1. Latest technology Mobile,Who is Unseen....? For photography, Redmi 6 Pro sports an AI dual-camera setup of 12-megapixel and 5-megapixel cameras.The first sensor is IMX486 from Sony whereas the secondary sensor is from Samsung. It has Phase Detection Auto Focus (PDAF) and large 1.2um pixels. It also supports Electronic Image Stablisation (EIS) for video recording. It has a 5-megapixel front-facing camera for selfies. On the software front, it runs Android 8.1 Oreo with MIUI 9 layered on top. Connectivity options include dual-SIM (2+1, dual nano-SIM and microSD card slots), Bluetooth, Wi-Fi and VoLTE among others. The smartphone is powered by a 4,000mAh battery. Xiaomi Redmi 6A also comes with a 5.45-inch Full HD+ display with an aspect ratio of 18:9 with no notch. The smartphone runs on MediaTek Helio A22 processor. It comes with 64GB built-in storage. Xiaomi Redmi 6A features 13-megapixel rear camera and a 5-megapixel front-facing camera. The phone has Electronic Image Stablisation (EIS) for video recording. There’s also Phase Detection Auto Focus (PDAF). The phone is powered by a 3,000mAh battery. Rest of the specifications is same as Redmi 6 Pro’s. Connectivity options include Dual 4G VoLTE, and a triple SIM slot. The phone also has a face unlock feature. Xiaomi Redmi 6 has a 5.45-inch display with 18:9 aspect ratio. It also sports a dual-rear camera setup with 12-megapixel and 5-megapixel sensors. It has a 5-megapixel AI selfie camera. The smartphone is powered by a 12nm-based Helio P22 12nm octa-core processor. Connectivity options include dual-VoLTE and dual-SIM. It has fingerprint sensor on the back. The smartphone is powered by a 3,000mAh battery which is claimed to deliver up to 9 days of standby time, up to 23 hours of music playback, up to 29 hours of call time, and up to 12 hours of video playback. Tags:- redmi,mi,redmi note 5,redmi 6, Redmi mi 6, Redmi 6 pro.